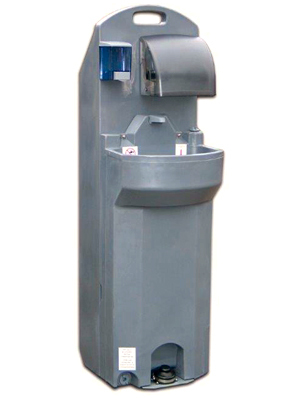 The HandStand™ hand wash station is composed of a 16 gallon foot operated hand wash sink attached to a 19 gallon gray water holding tank. The soap dispenser holds 30 fluid ounces of liquid soap. The paper towel dispenser is designed to accept single or multi fold, as well as roll towels. Ideal for use in offices, classrooms, construction sites, festivals, and food service locations. Suitable for indoor or outdoor use. The compact design allows it to be used most anywhere. Ideal where space is limited.